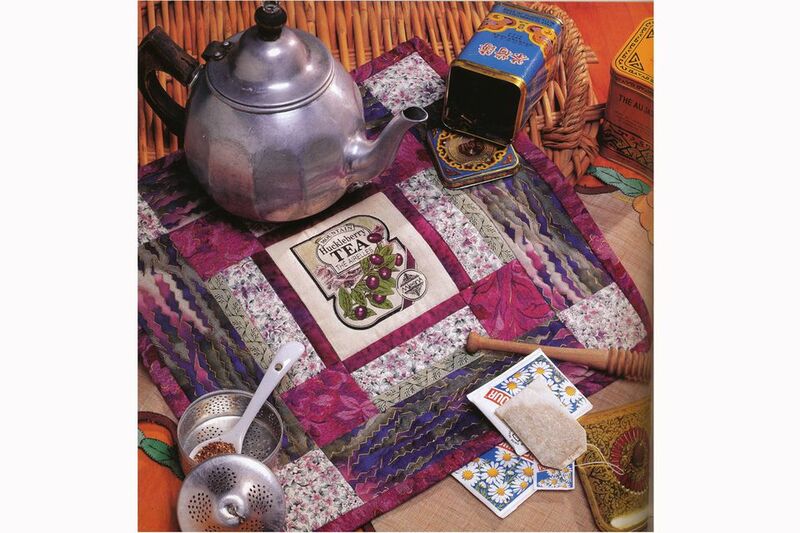 Have fun creating a bit of home decor with this easy mug rug pattern with a themed center. If you wish, increase the mug rug's size by sewing extra borders or make it smaller by stopping after adding the innermost patchwork border. You'll find lots of products with printed bags in gift shops and they contain everything from soaps and other body products to soup mixes. If you can't find a bag, either print an image onto fabric instead or use a fussy cut piece of novelty fabric for the center of your mug rug. A border stripe is another good choice for the center of this little quilt, and other portions of the border print would look wonderful repeated throughout the project. This project started with a 5-1/2" x 5-1/2" square and finishes at about 15-1/2" x 15-1/2". Your mug rug may differ in size, but it's easy to customize the project to alter its dimensions. The image features a tone on tone fabric that looks somewhat solid for the narrow border that surrounds the square. Slightly wider strips between the two narrow borders are a small scale floral. The outer narrow border next to the floral is a green tone on tone fabric, but the print is very visible. Inner cornerstones are cut from another similarly colored (but lighter) fabric with a larger scale print. The outer border is a modern directional fabric. Outer cornerstones repeat the floral used in the block's interior. Binding repeats the fabric used for inner cornerstones. Your choices will differ but do try to sew with an assortment of print scales and textures. Sew the mug rug with an accurate quarter inch seam allowance. Cutting instructions assume that you will start by cutting a 5-1/2" x 5-1/2" center square. Wait to cut (and read instructions at the bottom of the page) if you use a center of a different size. (1) 5-1/2" x 5-1/2" square, fussy cut with the motif centered if that's the look you're trying to achieve. If you prefer not to strip piece, cut (4) of each fabric, the same widths but all 5-1/2" long. Strip Piecing Tips for Quilters can help beginning quilters decide which method is the best choice for their needs. Figure 1. Sew the three 23" long strips cut for the inner patchwork border together lengthwise, with the 2" wide strip in the middle. Press to set the seams (always important) and then press seam allowances towards the center (direction doesn't really matter, but pressing towards the wider strip creates less bulk). Square up one end of the strip set and then cut (4) 5-1/2" segments. If you are not strip piecing, sew three of the 5-1/2" long strips together as shown in Figure 1, bottom. Make four units. Figure 2. Sew a Figure 1 unit to opposite sides of the center square, matching all edges carefully and taking care to position the narrow bar you've chosen for the innermost area of the border against the square. Press seams towards the center. Figure 3. Sew a 3" x 3" square to opposite ends of each remaining Figure 1 segment. Press seam allowances towards the squares. Figure 4. Sew a Figure 3 unit to the top and bottom of the partial quilt block, matching all edges and seam intersections. Check placement to make sure the correct color touches the block center. Use straight pins to keep matched fabrics from shifting. You could stop here to make a mug rug that finishes at about 10" square. Figure 5, middle. Sew a 3-1/4" x 10-1/2" strip to opposite sides of the partial block. Press seam allowances towards the long strip. Sew a 3-1/4" x 3-1/4" square to opposite ends of the remaining 10-1/2" strips. Press seam allowances towards the long strips. Sew one of the strips to the top of the block and the other to its bottom. Press seam allowances any direction. Sandwich with batting and backing. Quilt the mug rug. Remove excess batting and backing, squaring up edges (very) carefully if necessary. Finish the edges with easy double-fold mitered binding (or edge finish of your choice). You can use the same strip widths for borders and the same square sizes for cornerstones, even if you sew with a center square of a slightly different size. But the length of your border strips must be adjusted up or down to compensate for the new center square. For instance, if your center square is cut to measure 6" x 6", your inner border strips must each be 6" long to match the sides of the center. Your outer border strips will vary, too.